Chief Executive Officer and Managing Director are the two key and senior most members of a company. The duties of the CEO are often confused with those of MD and vice versa. However, both Chief Executive Officer vs Managing Director can perform duties similar to each other, but the mere existence of these two corporate titles indicates that there will be a substantial difference in their roles. Both reports to Board of Directors. More recently, the organizations have started identifying the significance of the two roles and have incorporated the same into their structure. A senior executive of the management of a company who takes important decisions related to a company. Below is the top 5 difference between Chief Executive Officer vs Managing Director. Running a firm successfully: Irrespective of internal and external factors, the ultimate goal of CEO & MD is to achieve a business objective and running operations of the company smoothly. Code of conduct: CEO / MD is expected to maintain integrity as CEO is no less than a representative of the firm to the outside world. On the other hand, MD mainly represents the firm internally by leading and motivating employees of the company and by setting up examples. Accountable to the Board of Directors: It is the utmost duty of CEO / MD to keep Board informed on the status of policies, goals, and targets defined under corporate governance. Due to the increasing complexities in the current business environment that have increased the importance of having two different positions. The concept of separate MD and CEO started from the US-based firms, and it got acceptance with the UK and the European based entities due to increased difficulties in the corporate environment. Although the roles and responsibilities of both the titles depend on factors such as legal structure, size of the company and Article of Association defined under Corporate Governance, which may vary from company to company. In small organizations, the requirement for creating a different level is not required. 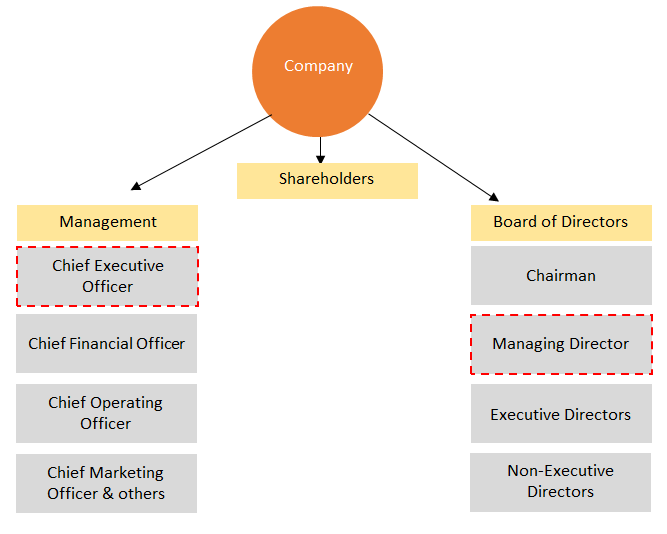 In many cases, a person can hold both the titles CEO and MD at the same time, subject to laws defined by Article of Association. Chief Executive Officer vs Managing Director has a common goal of managing and execution of operation where MD can play an advisory role. It is considered ideal if the same person doesn’t hold the same position as it helps to avoid dysfunctional group dynamics and maintains the independence of individual role. Their main goal is to run a business successfully and maximize shareholders wealth. Functional role of two might be similar to each other but there will always be legal distinctions between two. While the primary authority to define missions, visions and governance are vested in shareholders and Board of Directors. Board further delegates the powers to the CEO and MD to manage the organization and routine operations of the company. CEO / MD is answerable to the Board of Directors for the performance and all circumstances which may have a significant impact on an organization. This has a been a guide to the top difference between Chief Executive Officer vs Managing Director. Here we also discuss the Chief Executive Officer vs Managing Director key differences with infographics and comparison table. You may also have a look at the following articles to learn more.